On a rainy August night in 1800, slaves huddled in small groups on plantations near Richmond, Va., waiting for a signal to rise up. Led by a slave named Gabriel, and comprised of close to a thousand slaves armed with tobacco-cutting scythes, the insurrection planned to seize Richmond’s armory, capture Governor James Monroe and then ransom him in return for the slaves’ permanent freedom. Twenty years after Gabriel’s insurrection was cut short by a rainstorm that swept away key bridges between plantations, Denmark Vesey, a Charleston, S.C. slave, led an equally ill-fated revolt of thousands of slaves. They had planed to burn Charleston, escape on a captured ship and flee to Haiti—the only place on the globe where a slave revolt had succeeded in seizing a colony from plantation owners. These insurrections were energized by new freedom movements sweeping the Atlantic coast. As summarized by historian Patrick Rael in his Eighty-Eight Years: the Long Death of Slavery in the United States, 1777-1865, the revolutionary radicalism of the American Revolution, as well as revolts fueled by that radicalism in Haiti, St. Domingue, Puerto Rico, Cuba, Martinique and elsewhere, bolstered a new generation of slave insurrections in the United States. As evidence of those direct links, Gabriel’s band of slaves adopted the slogan “Liberty to Slaves,” while Vesey’s rebellion was to begin on Bastille Day, in celebration of the French Revolution’s ending of slavery in the French colonies. Both revolts were followed by harsh retribution—Gabriel, Vesey, and several hundred slaves were hunted down and hanged. Shortly after, the Virginia legislature passed a law requiring all emancipated slaves to either leave the state or be re-enslaved, while a law was passed in Charleston requiring all black sailors docking in the city to be imprisoned for the length of their stay. The ultimate destruction of the slave system required white northerners to join with freed and enslaved African-Americans to build a broader Abolitionist movement, but without the slave revolts as a spark, abolition would have remained impossible. Beginning in the late 1990s, people in rural communities—being targeted by agribusiness and other corporations—began to ban factory farms, toxic waste dumping, water pumping operations and other environmentally damaging corporate practices. In places like Belfast Township, Pennsylvania, Barnstead, New Hampshire, and Shapleigh, Maine, people began to do what they had been told for over a hundred years that they could not do—adopt municipal laws to stop harmful corporate activities. The rule of law under which municipal communities are prohibited from interfering with corporate projects as long as those projects comply with state and federal law, is built from legal doctrines manufactured by the same corporations protected by those doctrines. Those doctrines include the protection of corporations with constitutional “rights” and the punishment of municipalities who interfere with those rights, as well as the outright authority of state and federal governments to nullify municipal laws. People who run corporations have a menu of options at their disposal to eliminate lawmaking that “interferes” with corporate prerogative. They may either use state legislatures to adopt new laws preempting and nullifying local laws, or they can use their corporate “rights” to get a court to overturn local laws. Effectively, local laws aren’t laws at all, but mere suggestions to corporations regarding how and whether they should operate in a community. In many ways, they only have weight if corporate executives voluntarily agree to abide by them. Stripping communities of the legal authority to stop corporate projects not only uproots people’s ability to decide the future of their municipality, it supplants it with corporate authority imposed from outside the community. Thus, communities stopped from saying “no” to big box stores are prevented from building vibrant, sustainable downtowns; communities unable to say “no” to corporate factory farms are prevented from building and supporting small-scale, sustainable agriculture; and communities unable to say “no” to gas fracking operations are prevented from protecting clean water and breathable air. Lacking the authority to decide what happens, communities are transformed into mere resource colonies, while residents are converted into squatters on their own land, merely enduring whatever the corporation chooses to give them. Just as the Abolitionist community faced not just the behavior of individual slaveowners, but a system of law that protected the practice of slavery, communities today face not just the behavior of individual corporations, but a system of law that insulates corporate power from democratic control. Slaves and Abolitionists confronted a system of law that constitutionally disenfranchised the enslaved population and placed the federal army at the disposal of states to put down insurrections. Aligned with such political and military power was national economic power. Northern banks and textile corporations amassed enormous fortunes from the southern cotton trade, New England shipping corporations were heavily invested in the slave trade, and early agribusiness corporations made fortunes from the growing and shipping of food to plantations in the West Indies. In the words of historian Richard Grossman, the system created and maintained a “slave state,” where governing power was held by those invested not only in the existence but in the business of slavery. The U.S. Constitution protected the business side of slavery by affording commerce the highest constitutional protections. The creation of the “commerce clause” within the Constitution, which bans local and state governments from directly regulating large areas of industry, can be directly traced to some of the wealthiest “founding fathers,” who sought to prevent local and state governments from interfering with commerce and industry. Washington himself, anxious to prevent state bickering from impeing the Potomac canal projects he deemed vital to trade—projects in which he was personally invested—sought the power to override them. Those commercial protections, far from being destroyed by those who eventually brought down the slave state, morphed to protect rising industrial and commercial powers, which now exist in the form of corporations. Given the structure of constitutional protection, the recognition of constitutional rights for corporations by courts and judges wasn’t a mistake, but a natural evolution of the law. 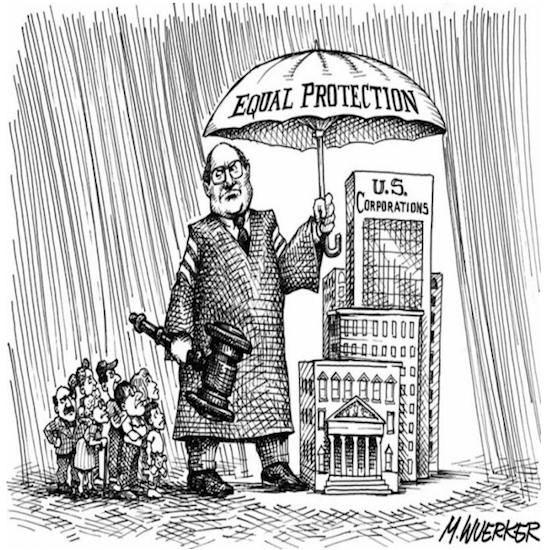 After all, if commercial rights were protected by the highest constitutional protections, why would those protections not be extended to the nation’s largest commercial actors, the corporations themselves? Slaves had to join forces with scores of free blacks and white Abolitionists, for slave revolts to turn into a movement powerful enough to dismantle the constitutionally-enabled “slave state.” Likewise, while not putting their lives on the line, as slaves were forced to do, thousands of people today in close to 200 communities across the country have begun to liberate themselves from the “corporate state.” Small, rural communities like Grant Township, Pa. are harnessing the power of their municipal government to adopt local bills of rights banning frack wastewater injection wells, corporate factory farms and corporate water withdrawals. Those municipal laws elevate the rights of residents above the claimed “rights” of corporations, while openly rejecting the authority of the state and federal government to prohibit the community from banning those harmful projects. As with the slave insurrections, these beachheads will not survive without the solidarity of thousands of other communities, and without the support of the broader political community—both liberal and conservative. While professing to believe in local, grassroots, democratic control, most mainstream groups have failed to support the growing movement for community rights. Professional environmentalists within the “Big Green” groups—groups that held so much promise in the 1970s—have been at the forefront of steering communities away from challenging the existing structure of law and government. Because of that stance, it is those groups that now share more similarities with the corporations exploiting communities than with the communities themselves. Both are content to battle it out within regulatory agencies, where the ultimate decision has almost nothing to do with whether the community can reject corporate projects, but only with how the project will proceed. Slaves, free blacks and Abolitionists faced their own fox in sheep’s clothing—a group called the American Colonization Society. As with the big environmental organizations of today, the group was backed by prominent national figures including James Monroe, John Jay and Daniel Webster. Buying land in Africa to relocate newly freed slaves, the organization touted itself as putting blacks “into a better situation.” The primary motive of the organization, as described by the group itself, was to “be cleared” of all African-Americans by shipping them overseas. Rather than pretending that the Society had the same goals as the Abolitionist movement, leading white Abolitionists, like William Lloyd Garrison, called out the Society directly, accusing it of embracing the second-class status of African-Americans and perpetuating discrimination and prejudice. Eventually, under the onslaught of the free black community in the North and white Abolitionists, the American Colonization Society was forced to dissolve. A similar drive must be led to clear the landscape of big environmental organizations, whose goals are not the same as those working to recognize the legal authority of communities. “Better regulation” of energy, agriculture, and transportation corporations only validates the authority of those corporations, and the highest levels of government, to continue on the same path. Unless we change the decision makers, our march toward ecological destruction and the elimination of democratic self-government will continue to accelerate on its way off the cliff. In response to slave insurrections in the South, in February 1834, students at Lane Seminary in Cincinnati sponsored a debate about whether slavery should be immediately abolished. In return, they were threatened with expulsion. In response, they withdrew and enrolled at Oberlin College where Ted Weld and a small band of a dozen others laid the groundwork for an evangelical Abolitionist movement that would eventually reach into churches, lofts and schoolhouses across the North. Today, the small band of communities taking on the world’s largest corporations have upped the ante, much as Weld and his brood did in the early 1830s. Communities in seven states have now joined hands to create statewide community rights networks. Those networks are now proposing state constitutional changes which would elevate the rights of communities above those of corporations. They have also come together to propose a federal constitutional amendment that would recognize the legal authority of communities to ban harmful corporate projects and redefine corporate “rights” at the municipal level. It’s time to understand that the community rights movement is the movement that we’ve been waiting for—one not limited just to environmental issues, but one which can be used to advance indigenous rights, expand workplace rights, impose police accountability, challenge bank foreclosures and establish rights to housing and healthcare. Along the way, it promises to finally liberate us from the people that we’ve become—slaves in all but name. Indeed, we are slaves in that taxes on economic effort force us to work part of the year for local, state, and federal governments. Community rights is too little too late. The War of Secession put the states in their places. Then the progressive movement in the late 1800s and the early 1900s gave rise to a nanny state in Washington. We have welfare rights to housing. That was a precipitating factor in the Great Recession. Subsidized employer health insurance since World War II and Medicare worked against any equitable health care that would not bankrupt the system. The only hope for the community rights movement is in the awakening of the public to a revolution long overdue according to Thomas Jefferson. This is not likely since community rights activists are ignoring the 300 pound federal gorilla. see: Institute for Rural Journalism for US rural topics. A large percentage of under povertyis in rural counties while %93 of immigration is concentrated in urban metro areas. There are a number of business es outside of urban sprawl .